Welcome! 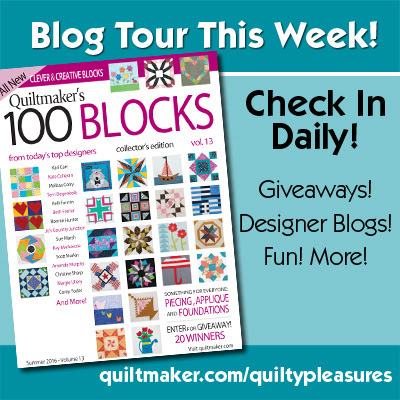 Today is my day on the Quiltmaker's 100 Blocks Blog Tour. If this is your first time visiting, please take a look around to see my current projects, tutorials and current patterns. Quiltmaker is hosting giveaways every day this week on their blog - Quilty Pleasures - so be sure to hop over there too! You will also find the list of other designers who are featured today. Here is my block - Joyful Brellies. I was inspired by the season to create a block full of umbrellas for April showers - even though we probably had more snow here than rain in April! 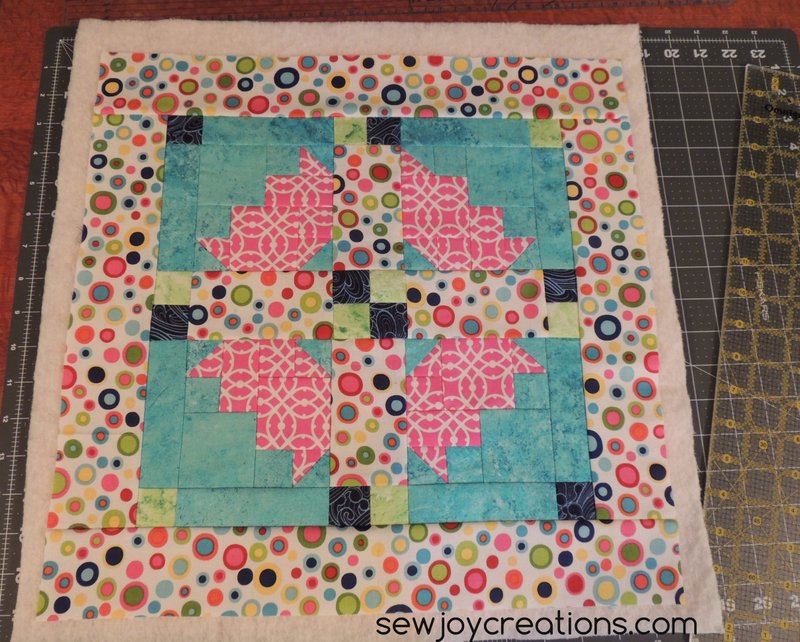 I loved using Pat Sloan's The Sweet Life line to make this block. I am a big fan of Pat Sloan and the enthusiasm for quilting that she shares for quilting online. I was happy to be able to showcase her fun fabric in this block. For the blog tour I made my block into a pillow and changed up the color placement. This time I made all of the umbrellas the same color - and the backgrounds too! The fun polka dot print contains all of the colors of the fabrics I used. This could be a fun bridal shower or baby shower gift. You could also make several of these blocks into signature blocks by having guests sign the umbrellas then put the blocks together into a quilt. 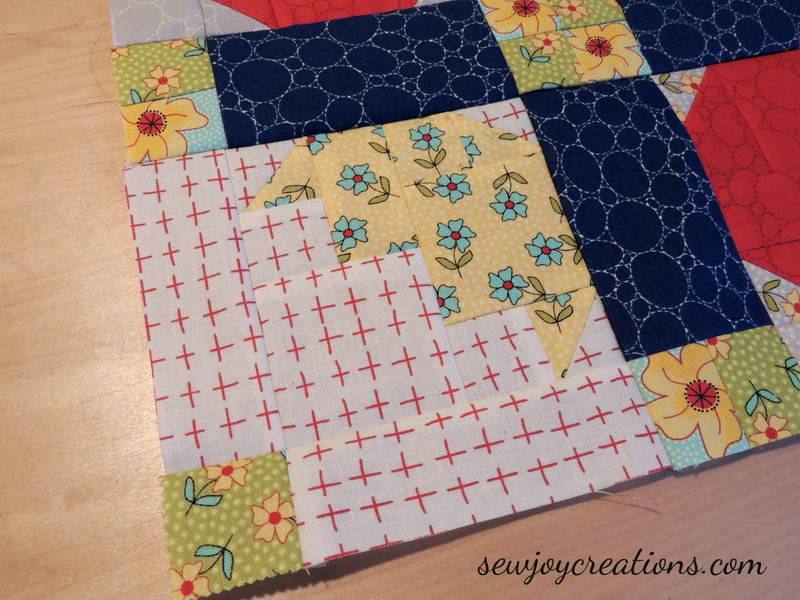 To make the block into a pillow I added 2 1/2 inch strips in the polka dot fabric to each side of the block. Then I quilted the pillow top to make it firmer so it would keep its shape better. I used the envelop method to make the back, cutting one 16 1/2 x 13 inch panel and one 16 1/2 x 9 panel. I added hems and then sewed the three layers together with the pillow front on the bottom right side up, followed by the longer panel with the hemmed edge towards the middle of the block right side down, then the shorter panel right side down with the hemmed edge overlapping the other panel. I sewed all the way around the outside edge, back stitching where the panels overlap and then clipping the corners. Turn right side out and put your pillow inside. Then enjoy! Giveaway is now closed - winner has been contacted by email and will be announced soon! Quiltmaker is giving away one copy of the Volume 13 issue at each blog stop. Inspire others to enjoy the blocks too! Sign up for my newsletter to keep up with my quilting creations! I always get inspired when looking through the magazine, no matter which project I have in mind. I'm usually looking for a block to make a quilt for someone. I have collected every one of the 100 Block magazines and love looking at them for inspiration. I guess I would say runners as there are so many that I want to make. Very cute block! I love seeing all the blocks whenever the blog hop an the magazine comes out. I've made a few into quilts, but mostly I use them for inspiration. Oh this block is just sooo cute! I love to use blocks in tablerunners, pillows, bags, placemats and often I love to just flip through the pages and think about what to make next. It is very inspiring,lol! I am planning to create sampler quilt(s) of similar blocks! Congrats! I just like browsing through the book and looking at the variety of blocks people have designed. congratulations. such a fun block. from the magazine i really like making place mats and baby quilts. Such a fun way to make umbrellas! I love seeing all the new block from quilters. I like to make lap quilts and table runners from the blocks. There are so many ways to use the blocks. I really enjoy the creativity and inspiration. I do like to use them as table runners. Thanks! what a cute block! I love the quiltmaker block magazines! they are great for inspiration and trying new techniques! I prefer making quilts with the blocks. 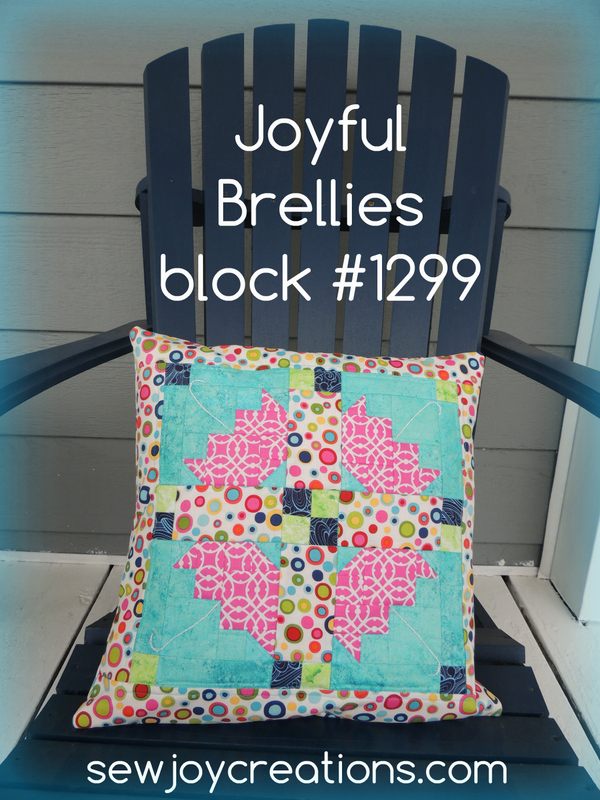 Love your Joyful Brellies block. I see a table runner and pillows coming up soon. Thanks for the chance to win. I love to make table runners and toppers, and this magazine is a great source of inspiration. I have a cousin getting married soon. A table runner and pot holders using your Joyfull Brellies block would be perfect! Thanks for the chance to win! I like finding blocks that play together well and make a quilt. I should count how many I've made. That is such a cute block and would definitely come in handy for a pillow for a birthday present. I find a block (like yours) and then usually make a quilt for me or a family member. There are so many talented designers with their own ideas that will also help you decide what you could do with their block and then you just follow their creative idea. Thank you for being a part of QM's 100 Blocks and the chance to try and win a copy of this magazine for myself. This is a cute block! I love 100 Blocks for the inspiration. Hi! Great block!! thanks for sharing! I love reading the 100 block magazines - great for inspiration!!! I have every issue of 100 Blocks, and use them to choose a block that would make at least a throw size. I love all the inspiration from QM's 100 blocks. Tablerunners help me use more of the blocks. Love yours. I made a Christmas sampler quilt using blocks from a couple of issues. I love the umbrella block, would use it to make potholders! Someday I plan to make a sampler quilt using my favorite blocks over the years. I like using the blocks for place mats for those in a rehab center near by. Since there are so many blocks to try, I think table runners would be my best bet. Otherwise, I'll never finish anything! I want to make. Very cute block! I love looking through the magazine, getting ideas for my next project. I usually don't look for something specific. Usually, I look for blocks to use in a quilt. I like your umbrella quilt block and its versatility. It would be fun to make tablerunners or pillows with any of these blocks from the magazine! Yours is so cute! Thanks for the giveaway! Cute block!! I like to use them as table toppers. The 100 blocks are my favorite editions from the magazine. I use the blocks for block swaps, birthday blocks or sometimes a certain design will demand to become a full blown quilt. Adorable block. Love to make table toppers and wall hangings. Cute block! I usually use them for the times I need to make a block to swap or as a block in a sampler quilt. 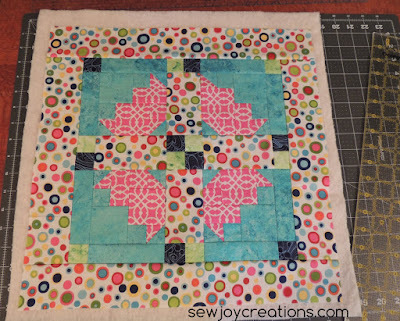 Quiltmaker's 100 Blocks is just perfect for making a sampler quilt! Such a cute idea with the umbrellas. I like the idea of using the blocks for potholders but would prefer to make a sampler quilt from the 100 blocks. Inspiration, then figure out how I want to use the block or blocks. My favorite way to use the 100 Blocks Magazines and the blocks within is as a resource when I'm making sampler quilts. The magazines are as good as an encyclopedia of quilt patterns, and I can always find something that suits my needs and inspires me to get started. I'd probably use the 12" blocks in a table runner/topper or a wall hanging. Those are the best sizes for me to work on. I think I would use your great block in a table runner. What a darling block. I love your idea that you could also use this block to have people sign it. I love Quiltmaker's 100 for inspiration as well as making blocks from. I love making tablerunners for quick gifts. I made a quilt for by granddaughter when she was born. I used about 5 different bird-related blocks (our last name is Bird! ), a replica of my son and d-I -l's birth announcement (also "bird-related! ), and flying geese sashing. I love to go through 100s block books looking for blocks that would go well together when looking for new quilt ideas! I love using the blocks from the magazine for baby quilts. I think baby quilts are especially fun to make. And even when I don't sew the blocks, I get inspired just looking through the magazines. The blocks are a wonderful way to find inspiration for quilts. Congratulations on your block being selected. I've been collecting fabric to make an umbrella quilt. Love your block Sarah! My favourite way to use the blocks are in quilts, especially baby quilts! And checking out FB or blogs are my ways to get inspired too. I love making new blocks and combining those in a quilt. I mainly am a scrappy quilter. This one is really pretty. I am new to quilting. This is the first I have seen of this. I love to use the blocks for quilts and runners! Love your pillow and the fabrics you chose. I like to make 12" hangings. Fun block! I love sampler quilts, and have used the blocks in the 100 blocks magazines in sampler quilts. I like to pick a block or two and see how well they play together to make a quilt. Love your block! it looks great.I find my favorite blocks and then make pot holders! I've used blocks from the 100 Blocks issues for several charity quilts. I can always find a block that will work. Super cute block, Sarah!! I like the idea of using for a shower also, but I'm also fond of umbrellas!! Since April is my bday month, I love April showers!! I also like making table runners or toppers, when you just can't make an entire quilt, but want to make a quick gift, seems I turn to table runners. I have every issue of 100 Blocks - so fun just to look thru! l like to gather similar applique blox for a 9 or 12 block baby quilt/lap throw or make a BIG block baby quilt/lap throw. 1300 blox from 100 blocks mags to browse through is mind-boggling! love it! Cute block, I thought right away, "April showers". I like using the blocks for table runners or just a small wall hanging for an office wall. I agree this would make a cute table topper or runner for a wedding or baby shower. Cute! Such a great story of your block. It is truly a gem.thanks for sharing. I confess I am partial to your designs, as my name is Joye (with an e). Thanks for the chance to win. Cute block. I have made several blocks from Quiltmaker's 100 Block issues for quilt swaps and for my own quilts. Table runners will be in my future sewing projects. Wish I had your blocker earlier this spring for our guild meeting to make mug rugs. I use the magazine bloks for table runners. I get your newsletter and came over to comment. I picked up my magazine today. The Brellies were one of the blocks I liked. QM 100 Blocks are a favorite of mine. I have collected all of them. Thanks for the Giveaway. Thank you for a chance to win. Your block is cute. I mostly use the 100 block magazines as eye candy. I enjoy look at the different blocks and dreaming. I have made a set of placemats for my mother and I am working on an I Spy quilt for my son. Your block is one of my favorites! I like to use the blocks in quilts. Cute block. I use the 100 Blocks magazines for ideas for sampler quilts. Thanks. Very cute block. Those umbrellas would be perfect here in not so sunny California (Love love love the rain). I've used the blocks to teach new quilters how to sew/quilt - 1-4 blocks in a wall hanging and they have a quick finish they can show off. Not only do I appreciate and use the blocks that I discover during the blog hops but I enjoy learning new sources of tutorials and free resources that I can share with my fellow guild and group friends. Most of my projects are service projects so the blocks end up in Threads of Love items or quilts for various agencies. I'd probably start with a wall hanging or baby/child's quilt. This block would be darling on a totebag, too. I enjoyed reading your blog post. I like your block - how it looks AND its name. I'm also a fan of Pat Sloan and I agree that her fabrics are great for your block. My favorite way to use the 100 blocks would be in a quilt. Great block by the way. They make great potholders and runners. I like to audition them this way. I've used blocks for our Christmas block exchange in our quilt guild. I've also used them for block exchanges where the block had to be a specific size. Always fun to see what the blocks are. I've been collecting the volumes. so far, I've used blocks in samplers...my favorites are always the stars! I have used the blocks in so many ways...wall hangings, BOM for our quilt guild, pot holders and bed runners. Congrats getting your block chosen for the magazine! Great block! I have used the 100 block blocks as quilts, table runners and once for a tote bag! I think the tote bag was one of my favorites! So cute Sarah! I love making pillow covers of favorite blocks! Congratulations! I love your Brellies block! I like the idea of making it for a baby or bridle shower gift. I am a new quilter and like to use the blocks in small projects like pillows, table runners, and wall hangings. Cute little umbrella's! I use the blocks in the magazine for inspiration and some go into larger bed quilts. I don't have a favourite way to use the blocks - I don't own any of the magazines as yet. I have some of the magazines and used a block for a pillow. I mainly make runners and rug mugs. What a cute block! An umbrella, just what I need for today's many showers...thought that May was suppose to bring flowers and not more flowers. I like to make blocks and then quilt them as I go, so that when I finish all I have to do is sew them together and then I have a quilt all done. Thank you so much for sharing your talent! I have a few of the magazines and really enjoy looking through them. I plan to make some of the blocks to showcase on my wire stand and then use other blocks in table runners and mug rugs. What a great block --- and so many setting possibilities. I want to make it NOW! These magazines provide so much inspiration. Very cute block! Makes a fun pillow. I like 100 Blocks as a source of inspiration. I love to make table runners and quilts from the blocks. If I'm iffy about a block I'll do it as a mug rug, or runner , then onto a quilt. 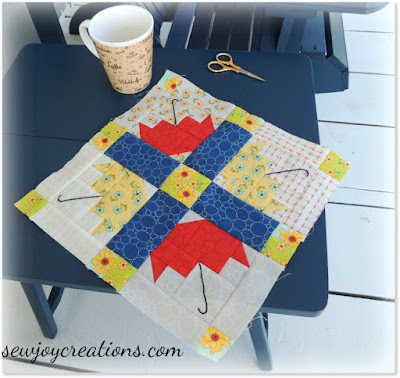 I love the idea of using blocks to make table runners. Your April showers block is adorable! Thanks for designing such a cute block and for posting the extra 'how to' info!! I find the 100 Blocks issues to be useful for all kinds of projects from big to small - they are great for quick projects to large long term ones! I like to try out blocks in something small like a pot holder or table runner. your umbrellas are darling, by the way. I'm thinking a fun picnic blanket since that season is coming upon us now. thank you for the chance at owning a great looking book. I'm always using the Quiltmaker Blocks issues to dream. Oh, to have the time to make all the beautiful ones that catch my fancy! I've used the blocks to make pillows! You ask how I use the blocks; I use them to daydream of everything that I could achieve. Really though, my use has been quite mixed but I never thought of a pot holder. These blocks are way too cute to be dirtied up in my kitchen. thanks for the giveaway, i love to do table runners to change out often and seasonal. Your block is adorable. Sampler quilts are fun to make with all these different blocks. I love the magazine and mostly just collect them...lol. I love to look at the pictures of the blocks over and over again!